The Vancouver Condo Buzz » THE COLUMBIA New Westminster Brewery District Condo Launch! THE COLUMBIA New Westminster Brewery District Condo Launch! Brought to you by Wesgroup, the new Brewery District New Westminster condos at The Columbia highrise tower will feature an enviable location just less than 200 metres from the Sapperton SkyTrain Station. The sales centre is opening at 285 Nelson’s Court New West (which is re-opening in Fall 2016) for the public grand opening at The Columbia New West condos. Other points of interest within walking distance from your new Brewery District condo home include Save-On-Foods, Shoppers Drug Mart, Browns Socialhouse, Take Five Cafes and Starbucks. The Columbia New Westminster condos will feature one, two and three bedroom condominium high-rise residences. The connected neighbourhood is only one stop from the Expo SkyTrain Line and 2 stops to the Evergreen SkyTrain Line, making it one of the most well designed transit-oriented communities in the Lower Mainland. Also, you are 25 minutes to downtown Vancouver via transit routes, 25 minutes to YVR airport by car and 5 minutes to Highway 1 by car. Residents at The Columbia Brewery District condos in New Westminster can enjoy access to over 12,000 square feet of outdoor amenities. These amenity spaces include shared garden plots, play area, large green space, spacious terrace with a lounge, BBQ and dining area. In addition, residents also have access to over 10,000 square feet of Club Central amenities at Brewery District New West. These include fully equipped fitness centre, yoga room, squash court, party room, treatment room, dance studio and meeting studios. The Club Central at Brewery District also features an entertainment room with a full kitchen. The newest release of presale New West condos at the Brewery District features two colour schemes that allow homebuyers to create a ‘soft’ or ‘bold’ statement. The homes will have laminate wood floors and carpet in the bedrooms. All floor plans will feature private decks or patios. The bathrooms will have semi-frameless glass shower, custom floating shelf for extra storage as well as Water saving Class Five Technology flush toilets. The Columbia Brewery District condos also feature porcelain tiled shower and bathtub walls in addition to a large soaker tub for a spa like experience. Other features include under cabinetry LED lights, wall mounted lighting and single handle Kohler faucets. The kitchens at The Columbia New West condos feature built in dining room table in most one bed homes, recessed LED lights under cabinetry, large format subway tiled backsplash for an industrial contemporary feel, elegant quartz counters, European style cabinets with soft close technology, modern under mount double bowl stainless steel sink, premium pull down kitchen Kohler faucet and full sized Whirlpool front loading washer and dryer. The kitchens at The Columbia Brewery District condos will also feature a premium appliance package in stainless steel finish that includes: 24” fridge with bottom freezer (one bedroom homes) or 30” KitchenAid French door fridge with bottom freezer, 1000 watt microwave oven, Energy Star KitchenAid dishwasher, intelligent Perfekt glide 30” pull out range hood by AEG and a 30” KitchenAid 5 burner gas convection range. From the Brewery District marketing desk for the New Westminster Columbia condos: “Following the recent success of The Sapperton, we want you to be the first to learn about our newest addition to Brewery District – The Columbia. Steps from the Sapperton SkyTrain Station, The Columbia is a mix of one, two- and three bedroom homes. 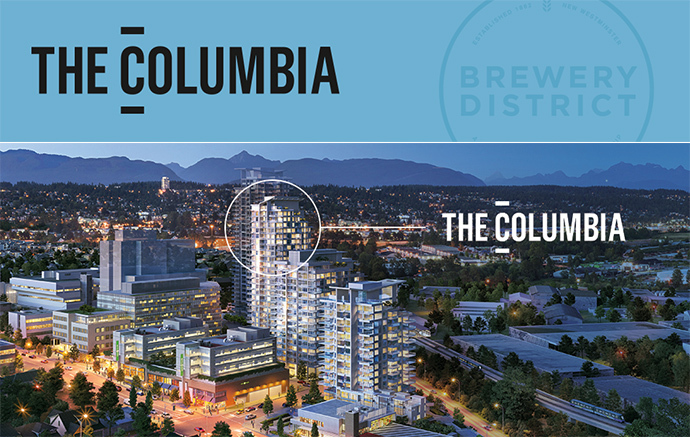 We are preparing to launch The Columbia at Brewery District this Fall and as a valued Brewery District registrant, we would love to hear from you via email or phone to get a better understanding of your interest and what type of home you are looking for. To better serve you, any additional information related to your search is welcomed, including number of bedroom(s), price range, and more. Don’t miss your opportunity to be a part of this vibrant new landmark! We will be in touch with you in the coming weeks with more information about this exciting new community. In the meantime, if you are interested in calling The Columbia at Brewery District home, please let us know. We look forward to hearing from you soon. It’s already all here! Save-On-Foods, Brown’s Socialhouse, Shoppers Drug Mart, Starbucks, TD Canada Trust. Coming Fall 2016. The Columbia Condos at Brewery District, the latest addition to New Westminster’s smartest community. The Lower Mainland’s best real estate value on transit only steps from the New West Sapperton SkyTrain Station brought to you by Wesgroup.” The New West Brewery District Columbia condos are also very close to top ranked schools and universities. Please stay tuned for more details about the upcoming presales events and grand opening public launch.